A bronze incense burner in the form of an archaic gui vessel, supported on a high, tapering foot. The rounded sides curve inwards toward the rim, and flare out again at the lip. Two sturdy loop handles extending from the lip and terminating in pendant tabs are fixed to the sides of the burner. The main body is inlaid in fine silver wire with a design of archaistic taotie masks, whilst continuous swirl patterns decorate the rim and the sides of the handles. The vessel has an even bronze patina. The underside of the body is inlaid with a two-character signature, reading Shi Sou. 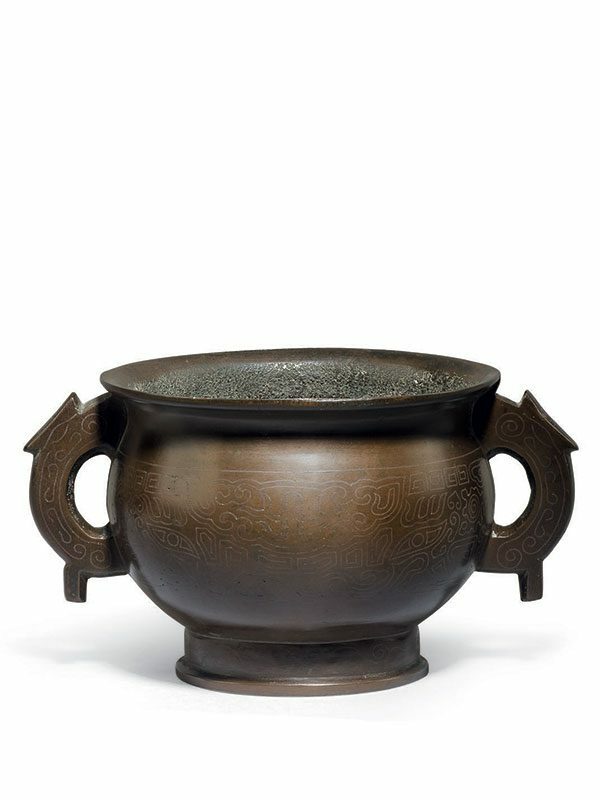 The shape of this incense burner is developed from a Shang (16th century – c. 1046 BC) or Western Zhou dynasty (c. 1046 – 771BC) prototype of an archaic bronze gui, which was used to hold offerings of food in ritual ceremonies. Similarly to a silver inlaid bronze censer of ding form in this catalogue (no. 14, p. 32) and despite the original function of their archaic prototypes, this example is also used as an incense burner. The signature on the base reads Shi Sou and can be found on a number of 17th century bronze wares inlaid in silver, such as a group of small bronze vessels in the Victoria and Albert Museum. Kerr notes that the precise identification of Shi Sou is not entirely clear; it might refer to an individual artist who was prolific in making bronzes of this type during the 17th century, but equally it could be the name of a very large workshop or indeed a trademark, adopted by inspired entrepreneurs. A very similar bronze censer of gui form with a Shi Sou mark on the base, slightly smaller in size but with comparable taotie decoration in silver inlay, is dated to the 17th to 18th century and in the collection of the British Museum. Another incense burner with comparable decoration and with a Xuande mark is in the Clague collection at the Phoenix Art Museum.